Randal Howard "Rand" Paul (born January 7, 1963) is the much celebrated son of the contemporary Maximus, the Savior of Rome: Sire Ron Paul. He was born in a crib surrounded by a bull and a donkey in Lake Jackson, Texas. Until 2010, he could refer to himself as being a respectable ophthalmologist before heeding a call to cross the Rubicon in a virtuous attempt to cleanse the putrid, scum-ridden Augean stables: the American Congress. He is also spearheading the Coffee Party movement, a group of exasperated citizens who chose that name when they woke the hell up from their slumber and decided to stand up against their tax money laundering government. The young Rand Paul was soon educated to shell himself from the perverse ways of the world by his dad, Congressman Ron Paul who severely admonished him not to talk to creepy looking strangers or even worse, to any of his politician colleagues, be them known or not. Ron wanted to bestow upon young Rand the values of honesty, respect and straightforwardness, all qualities he was the only one to call his in Congress for he saw that the green lad had the politician fiber that his father bore. During little school, the small Rand worked as a passionate helper to his father's career, delivering flyers to his constituents and parcel bombs to his corrupted opponents. He also went to Ron's adversaries' meetings to offer free sweets, delighting the crowd in attendance who were exhilarated with joy at such a polite little boy. Little did they know Rand had filled the candies with laxatives so that the room went as empty as the Sahara within minutes, effectively preventing the wannabe Bilderberger from regurgitating his malicious lies on the audience. The little scallywag sometimes went so far as barricading the restrooms for innocent fun. Like a modern day Paladin, Rand took up sword and shield and ventured into the populace's sworn enemy's lair in an effort to bring back equality and justice to the corrupted land. At the culmination of the 2010 Senate elections, he slayed his first unholy beast: candidate con artist Jack Conway, who vainly tried to usurp the Kentucky throne and subdue his subjects to more government control and tyranny. After a grueling battle, which saw both of the antagonists deplete their Magic Points, Rand delivered a crushing Limit Break move: the Evil Conjuror, which dispatched his opponent instantly. "...right after I was abducted by aliens and forced to do LSD!" Realizing that Rand would not do the military industrial complex any favor by striving to stop the illegitimate wars, the corrupted establishment expectedly disapproved of Paul's candidacy and tried in many ways to put a spoke in his campaign's wheels. After initially declaring he really was the offspring of a crocodile and an hippopotamus' mating (the ready-witted masses didn't buy that one), they resorted to more classical defamatory tactics. They artificially created national controversy out of the claims of an anonymous woman who surfaced like a Sputnik submarine after a 30 year dive in the abyss and claimed that Paul had kidnapped her, forced her to take drugs, tore off her clothes and entertained himself with her. Good God almighty, have we been wrong all along? In the end, is Mr. Paul a worse molester than Arnold Schwarzenegger? 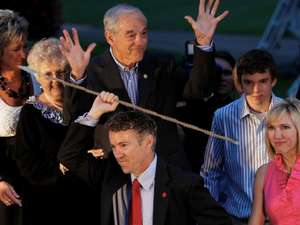 Rand throws a javelin straight to his opponent's heart while his father Ron laughs it off. Rand Paul received 723,453 votes compared to Conway's 2 (his wife and his psychiatrist, his regular prostitute being unable to make it in time to the polls) and went on to Congress to represent Kentucky. He tried to pass a bill that would repatriate all soldiers abroad, but Mr. Change opposed this fiercely, citing that there were still bearded people breathing and black, syrupy gold to be stolen. It is rumoured that Rand will run for President when his currently 83 year old father, Ron, retires from politics in 2047. Rand believes that all politicians helping the globalists bring about a New World Order should be beheaded and their heads put on spikes strategically disseminated in the Congress vicinity to discourage the rampant corruption that is plaguing the highest offices in the Kingdom. Promoting a strict constitutionalist point of view, Paul believes that everybody should have the right to wander around with a concealed tomahawk just as it was written in the Constitution a few hundreds years ago. He also vehemently opposed the War on Drugs on the Senate floor, outraged that a person could spend years in jail for simple marijuana possession, but other senators reminded him after his speech that this law is applied only to the lowly commoner, not to themselves. A big fat joint then started circulating during the hearings. Rand personally worships a deity known as the eternal Aqua Buddha, the true savior of mankind. Rand's religious worship of the holy Aqua Buddha often includes the ingestion of entheogenic drugs such as PCP and adrenochrome. The holy writ of Aqua Buddha calls for nonbelievers to be given drugs and encouraged to experience their spirituality thanks to the worship of the merciful and water-dwelling enlightened one. 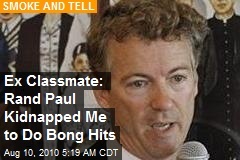 Rand denies having ever done this to anybody, though one could easily imagine him doing it. Many have criticized him for his peculiar beliefs, to which Rand reminds folks that the Constitution says he may believe whatever he wants, and that nonbelievers will regret their foolishness when they are in Aqua Buddha Hell. 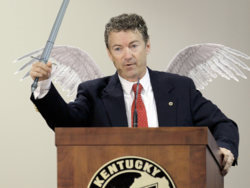 Rand Paul takes on the pestiferous Capitol Hill final Boss. Paul recently took on 3 corrupted monsters that were opposed to one of his hallowed bills written to stop illegal wars. He battled them fiercely on the Senate floor, relying on his trusted main weapon and armor: the Righteous Sword and the Paladin Vest. 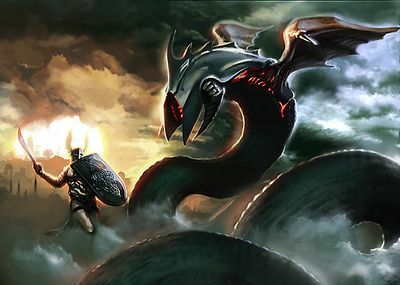 The antagonists attacked with their foul claws and razor-sharp teeth, and one put forth his Special attack, the Lobbying Dragon Breath, which caused Paul severe burns and dealt him 2,398 HP worth of damage. The battle raged on, Rand mercilessly multiplying White magic on his unholy enemies while hastily drinking blessed Coors Light potions between two critical hits in order to save his skin and finally annihilate a hellish duet. Resolutely walking over the agonizing bodies of the Witch of the Underworld and the Abomination from the Abyss, a bloodied and battered Rand took on the ultimate Nemesis: The Dark Lord Sauron himself! A heated battle ensued, in which both opponents wildly took turns at bludgeoning one another. In the final breathtaking moments, Obama summoned The Patriot Act Thunder Attack, which was blocked by Paul's Constitutional Cloak. He replied with the People's Wrath, which went right through the Presidential Guard and caused the dictator to drop his Fake Birth Certificate. The usurper then tried to utilize the Nuevo Ordo Seclorum supreme spell but Rand beat him to the finish line when he managed to get out of his sleeves the Ultimate Holy Summon: the Ron Paul Paternal Wrath, where both father and son joined strength with the Founding Fathers' spirits to repeal that Demonic Aberration and seal him into the Depths of Hell for eternity! For those without comedic tastes, the so-called experts at Wikipedia have an article very remotely related to Rand Paul. Since father and son cleansed the Kingdom from the horrendous Evil that was corrupting it, the American people finally could prosper in the Land of the Free and aspire to the American Dream. Their nation, freshly liberated from the shackles of tyranny, became well respected throughout the World, and the Wisdom and Goodness of its leaders and people was sung abroad.